A McDonald’s in a hospital cafeteria? Say it isn’t so! According to McDonald’s, it has 27 franchises In hospitals. One of them is in the world renowned Cleveland Clinic, in the top tier for treating heart disease and former home base of Dr. Caldwell Esselstyn (Prevent and Reverse Heart Disease). This isn’t to say the Clinic hasn’t tried to rid itself of this glaring contradiction to its public embrace of lower fat and sodium foods. While it succeeded in shedding Pizza Hut, McDonald’s remains out of contractural obligations agreed to more than a decade ago. Medical University of South Carolina University Hospital Complex (Charleston, S.C.): 5 fast-food outlets and a cafeteria serving country-fried steak and other high-fat fare. Naval Medical Center San Diego Hospital Facility Complex (San Diego, Calif.):3 fast-food outlets; patients order from menu featuring pork chops, meatball sandwiches, and other high-cholesterol fare. Duke University Hospital Complex (Durham, N.C.): 3 fast-food outlets; patients order from cafeteria menu featuring spicy pork loin and other high-fat items. Children’s Memorial Hospital Complex (Chicago, Ill.): 1 fast-food outlet; patients’ menu has chicken wings, quesadillas with bacon, and grilled hot dogs. McDonald’s says it offers a diversified menu that offers many options like salads. There are 14,000 McDonald’s in the U. S. Not one of them offers offers a veggie hamburger (unlike in Europe where it’s a government mandate)! By the way, of all the fast food franchises in the U.S. and Canada, only Burger King offers a vegetarian burger, though it comes with a white flour bun. Chick-fil-A recently set up shop in several facilities, including the Texas Medical Center’s St. Luke’s Episcopal Hospital and the Medical University of South Carolina University Hospital in Charleston, S.C. (Elana Gordon, April 2012). Let’s face it: Fast foods are a money maker for some hospitals, quite willing to betray their ethics–forfeiting the well-being of their constituents along with it–for the wrong kind of green. 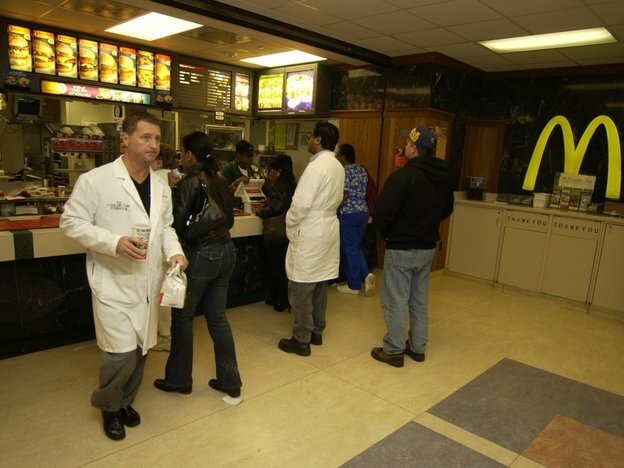 This entry was posted in Health, Reflections and tagged Burger King, Cleveland Clinic, fast foods, hospitals, McDonald's, Nutrition, Physician/s Committee for Responsible Medicine. Bookmark the permalink.